Prizzi's Honor was nominated for eight Academy Awards, including Best Picture, Best Actor, Best Director, and - of course - the one award it did win on Oscar night: Best Supporting Actress for Anjelica Huston. Upon its release in 1985, it was praised by many critics as one of the best movies of the year, and although I didn't see it until it hit home video, I remember liking it quite a bit as well. But for whatever reason - most likely because dark satirical comedies are much more commonplace now than they were in the mid 80s - Prizzi's Honor is one of those film that has just not aged all that well. It's probably been about 20 years since I watched the movie (perhaps longer), and I have to confess I find it rather middling now. Still very much a solid movie, but by no means a classic. It just doesn't seem as edgy as it once did. 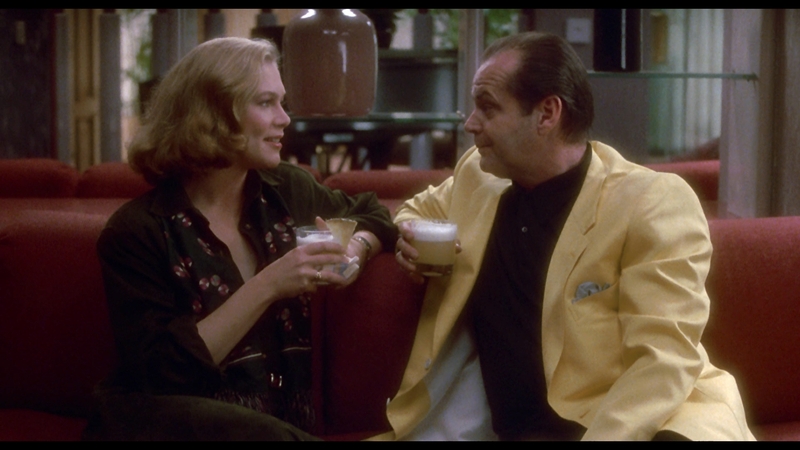 The film stars Jack Nicholson as Brooklyn gangster Charlie Partanna who, as the film begins, is attending a wedding where his eyes catch the form of Irene Walker (Kathleen Turner), a stunning blonde who Charlie decides he must immediately meet. They share a moment at the reception, but she disappears shortly thereafter, only to call him later from her home back in California. That doesn't stop Charlie from wanting to meet with her the very next day - flying across country to do so. Charlie doesn't realize that Irene is actually married to another mobster that he's been contracted to kill. After offing him, he gets half the money he stole (the reason he was killed) back from Irene - not knowing that she's secretly keeping the other half for herself. Angelica Huston plays Maerose Prizzi, a former lover of Charlie's who still has a torch for him. Naturally, she has no desire to see Charlie with Irene, so she gathers evidence on her own against Irene and presents it to the "family's" don, who is also her grandfather (played by William Hickey), who puts a plot in motion to get rid of Irene. Maerose is clearly the most intelligent of the characters in this movie, although just how manipulative she's been isn't crystal clear until the final scenes of the film. Of course, Prizzi's Honor was one of the last movies (his next-to-last, actually) directed by the great John Huston and while he got a lot of acclaim for this movie at the time of its release, it's actually one of his lesser efforts (keep in mind this is the guy who brought us three of Humphrey Bogart's best movies: The Maltese Falcon, The Treasure of the Sierra Madre, and The African Queen (all of which can be found together in this collection). Which is not to say this film is bad - it's actually fairly entertaining, despite the fact that almost all of its characters are as dumb as a doornail (particularly Jack Nicholson's lead) - it's just that with this caliber of talent in front of and behind the cameras, more should have been expected. Praised in its day, Prizzi's Honor just hasn't stood the test of time, although it's still work a viewing if you've never seen it. Prizzi's Honor arrives on Blu-ray in a standard Elite keepcase from Kino Lorber. The dual-layer 50GB disc is packaged alongside a 22-page full color booklet that features box cover images (four to a page) of other "Studio Classics" releases from Kino Lorber. 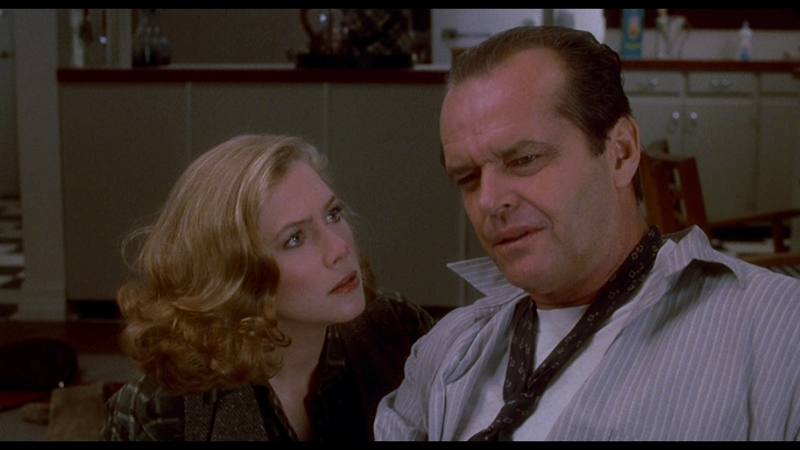 There are no front-loaded trailers on the Blu-ray, whose main menu features a still of the box cover image of Jack Nicholson and Kathleen Turner, with menus selections at the bottom center of the screen. Prizzi's Honor was shot on 35mm film and is presented on Blu-ray in its original theatrical aspect ratio of 1.85:1. It is my sad duty to report that this movie doesn't look very good on Blu-ray. While heavy grain is present throughout (not necessarily a bad thing), there appears to be noise mixed in there as well, making for a very unappealing presentation that only shows glimmers of detail in shots that are either outdoors or very well lit. On top of these issues is the fact that there's a lot of haloing in the movie. These are ghost-like borders around the edges of characters and objects that are often the result of the transfer being over-sharpened, although it's also possible (perhaps) that this is just a flaw in the source material. About the best thing that can be said about the transfer is that it does a decent job of color reproduction, but given all of the above issues, even that loses some of its luster. Of course, the blame for the image can't be aimed towards Kino Lorber. They're almost never involved with the transfers of their releases - instead having to go with whatever is provided to them by the studio that owns the movie. The big question here is which studio provided the transfer? Prizzi's Honor was made under the ABC Motion Pictures banner, which is owned by Disney. However, 20th Century Fox was the distributor of the movie when it was in theaters, and MGM handled the last official Region 1 DVD release of the movie back in 2003. Since Kino has a deal with Disney for a number of ABC Motion Pictures releases over the next couple of years (only a few of which have been released so far), chances are pretty good this is a transfer provided by the mouse house. Although the source of the transfer (a DVD upconvert? A transfer from a low-quality print?) is unknown, it appears highly unlikely what we get here is from an original negative for even a first-generation original print. The only audio track (other than the commentary track) on this release is an English 2.0 DTS-HD Master Audio track, and thankfully it's a lot better than the video in terms of quality, although there's not a whole lot here to emphasize, as Prizzi's Honor is still very much a movie that is heavy on dialogue and doesn't provide a whole lot in terms of ambient sounds. There's not much separation between the two speakers in this presentation, but everything is relatively crisp and clear with no noticeable dropouts. Viewers paying attention to the movie will notice some ADR (automated dialogue replacement) use throughout the movie, but that - of course - isn't an issue with the track itself. Audio Commentary - Frequent Kino Lorber commentary contributors Howard S. Berger and Nathaniel Thompson sit down for another informative track here. While there's tons of info relayed, my biggest gripe about the commentary is that the two gentlemen rarely comment about what's going on on-screen. Therefore, this is a commentary that one could listen two in the background while doing other things, as it's rarely screen-specific. Trailers - A collection of five trailers, all available from Kino Lorber and all of which must be watched individually (there is no "Play All" option). They consist of: The Missouri Breaks (SD 1:48), The Unforgiven (SD 4:30), The January Man (HD 1:28), Still of the Night (HD 2:06), and Malice (full-frame HD 1:57). Although Prizzi's Honor wasn't as enjoyable as I remember it being when I watched it back in the 1980s, but it's still a dark comedy loaded with interesting performances from one of film's most notable directors. The problem here is that this new Blu-ray release's picture quality is poor enough that this isn't much of an upgrade from the prior DVD version. The commentary track is really the only appeal here, which means this may be a title you'll want to take a look at, but it's not necessarily one that's worth owning. Rent It.